Happy October! The German holiday of Oktoberfest may have ended on October 6th, but, like many Americans, Matt and I use this holiday as an excuse to enjoy German bratwurst and beer for the entire month of October. 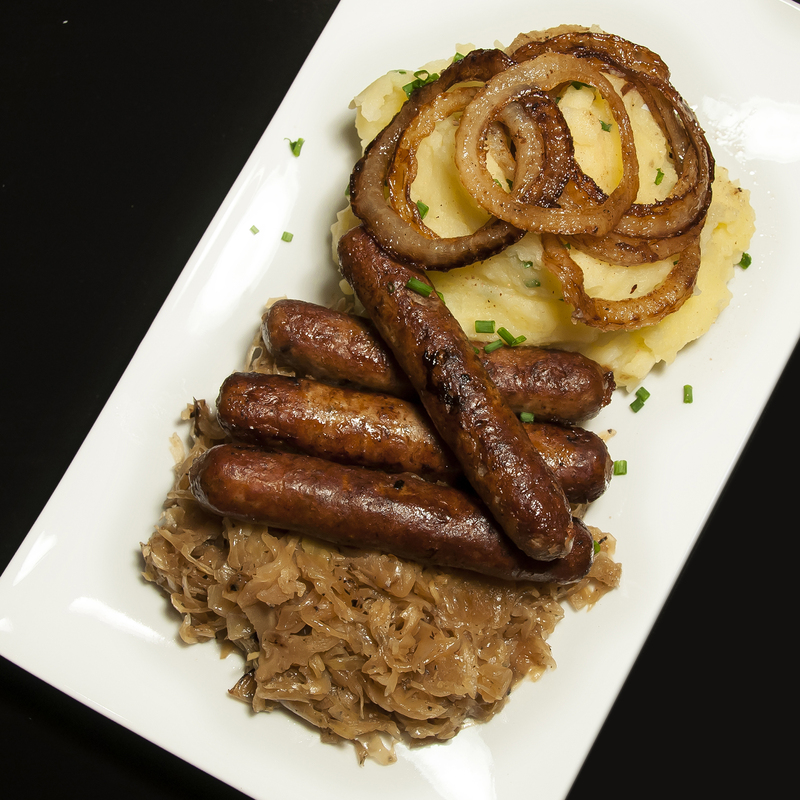 Last night’s dinner was no exception… We used a German recipe to make authentic Nürnberger Bratwurst with Sauerkraut, mashed potatoes, and crispy onion rings. YUM! We purchased our Nürnberger (aka Nuremberg) Bratwursts from a fresh sausage vendor at our local Farmer’s Market. The vendor explained that, unlike most brats you’ll find in a supermarket, Nürnberger Bratwursts are very small (about 4″ long x 3/4″ diameter) and are not served hot dog-style on a roll. Instead, several of these tiny sausages are served together over a bed of warm sauerkraut. This sounded good to us and, after some online searching, I found this authentic recipe to showcase these little brats. Naturally the recipe was written in German but with a combination of my limited German language skills from school and some help from Google Translate we came up with the following English version. Slice the onions to form thin rings (as thin as you can make them without breaking the ring). Set the onion rings aside and reserve the centers or any rings that break. Dice the centers. You should end up with approx. 1/3 diced onion and 2/3 onion rings. Place the peeled potatoes in a pot with salted water, cover, and boil for 20 minutes until soft. Drain the potatoes. Place the milk and 20 g (half) of the butter in the potato pot and warm over low heat. Return the potatoes to the pot, mash well, and add a few pinches of chives, ground nutmeg, and salt to taste. Stir well and cover. Meanwhile, in a large frying pan, saute the onions in peanut oil over medium high heat for 2-3 minutes. Add the sauerkraut (spoon it out of the can to avoid getting excess juice) and saute for 5-10 minutes, stirring frequently. Then, stir in the broth, juniper berries, and bay leaf. Cover and simmer for 20 minutes, stirring once or twice. Once cooked, transfer the sauerkraut mixture to a bowl and cover tightly to keep warm. Use a paper towel to remove any remaining bits of sauerkraut from your frying pan, then return the pan to medium-high heat and heat a tablespoon of oil. Add the bratwurst to the pan and cook in the oil until crispy brown on all sides, turning frequently (use a splatter screen to minimize the mess). Transfer cooked bratwurst to a plate and cover tightly with foil. Return the frying pan to medium-high heat and add in the remaining 20g butter. Dredge the onion rings in flour and spread them in a single layer on the bottom of the pan – you’ll need to do this in batches. Fry the onions in the butter until golden brown and crispy. Transfer the cooked onions to a paper towel-lined plate and continue to fry the dredged onion rings in batches until they are all done. To serve your Kartoffelpüree mit Bratwurst und Sauerkraut, spoon generous helpings of mashed potatoes and sauerkraut onto a plate. 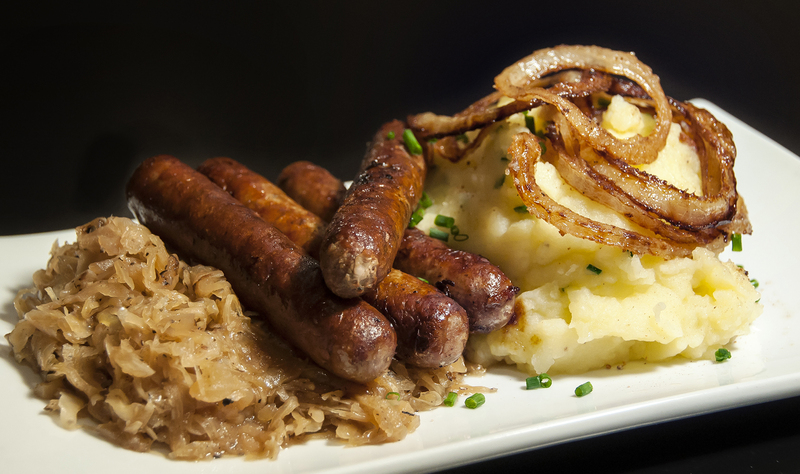 Place 3-4 bratwurst over top of the sauerkraut and garnish the potatoes with chives. Stack the onion rings on top of the potatoes and serve with a nice cold German beer. Enjoy! *Juniper Berries are a common element in northern European cooking and in this recipe they are used to flavor the Sauerkraut. We searched for Juniper Berries in six (SIX!) different grocery stores before finding them in our usual store, The Fresh Market. (Too bad we didn’t try there first!) If you can’t find Juniper Berries locally you can order them online at Spices, Inc. Your photos are sooo enticing! YUM! I adore bratwurst and this looks absolutely amazing! 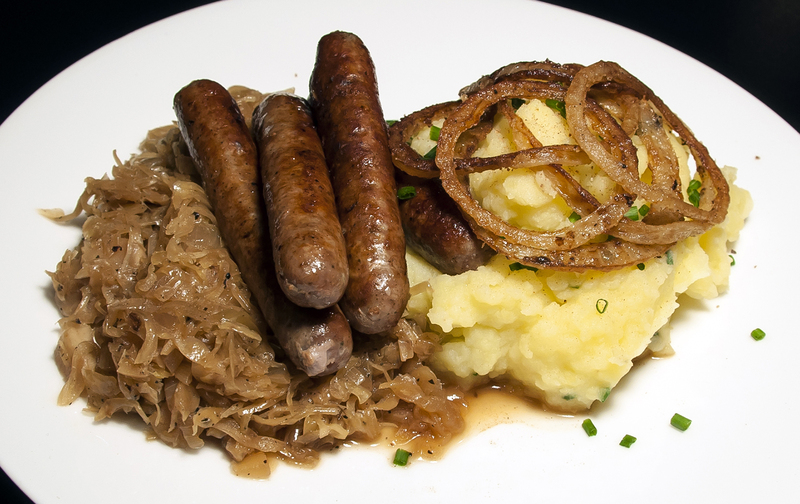 This looks delicious as I love German cuisine. I will have to try this! I love your dog! We have had German Short Hairs also. They are wonderful pets.